When my kids were little I always made their costumes for them. Those costumes then were handed down to nieces and nephews. Now my kids are grown, so it’s the dogs turn. 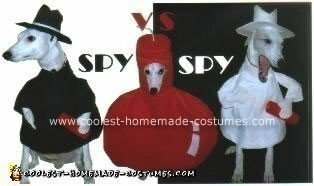 We always thought they look like Mad’s Spy vs Spy cartoon characters so that’s what I set out to make, Homemade Spy vs Spy Dog Costumes. The first problem I had was that I had three dogs and there are only two Spies. I decided the littlest one would be a bomb or a stick of dynamite. Making the coats was easy; getting the right arm length was a little more difficult. Dogs aren’t very cooperative about sitting for fittings; I went through a lot of treats! The hats were another challenge; I needed to make a space for their heads to sit in so they wouldn’t fall off. It took me many, many hours to make the costumes and after I finally stopped laughing, this is the result. what a fantastic job! I love all three costumes but think the bomb costume is fantastic. Very funny and extremely creative. Adorable pups too!